The one person standing in Terry's way, however, isn't the Huntress or any member of the Justice Society, but the Earthworm himself. It turns out the Earthworm also has a stake in the Huntress controversy, revealing the depth of Terry Marsh's corruption. More than Terry is a concerned politician looking out for the safety of Gotham's citizens, he is actually a member in the human trafficking ring that's been abducting children and selling these children to the highest bidder. Is Nedra Borrower aware of her lover's compromise and is initiating a public war against the wrong public figure? Or is Nedra just as corrupt as her lover if she is willing to side with a human trafficker to permanently damage another woman's reputation? One can only go so far! Review: It's a rather strange if not serendipitous coincidence that I would be reviewing this story on the same week Doomsday Clock #5 came out, picking up on the sub story arc surrounding Gotham's protests against Batman's vigilantism. But this is nonetheless where we left off from Wonder Woman #311 two months back. It's weirdly fascinating just how many things are unfolding at once in this one story arc. 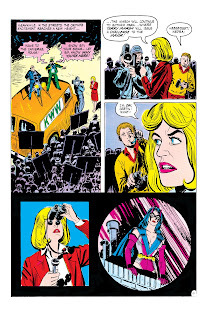 What started out as a one woman war against the Huntress quickly escalated into a full blown conspiracy as soon as more people got involved like Terry Marsh and the Earthworm. It does have me wondering how "in the know" Nedra really is in her own battle against the Huntress. Is she the one really pulling the strings or are other people (namely Terry Marsh and the Earthworm) pulling her strings? How did all of these people meet, and out of the three, who is really in control here? I would say this is one of the strengths of Joey Cavalieri's writing. He doesn't tell you everything at once, but gradually builds the larger conflict to the reader as the story progresses. He starts small and gradually reveals, which keeps the story interesting and keeps tensions high. I'm honestly starting to feel for Nedra in this story because it's increasingly starting to look like she's not as in control of this conspiracy as she probably thinks. In all likelihood, both Nedra and Terry are being used as pawns by the Earthworm, who is the primary antagonist. Unlike the Earthworm who has a repulsive appearance and lives a shady lifestyle, both Nedra and Terry look trustworthy and have public credentials. As a reporter, it is Nedra's job to report the truth. As a politician, it is Terry's job to take interest in the wellbeing of Gotham City if he hopes to get elected into public office. The Earthworm needs them way more than they need him and most likely exploited the ambitions and weaknesses of both people to progress his own agenda. 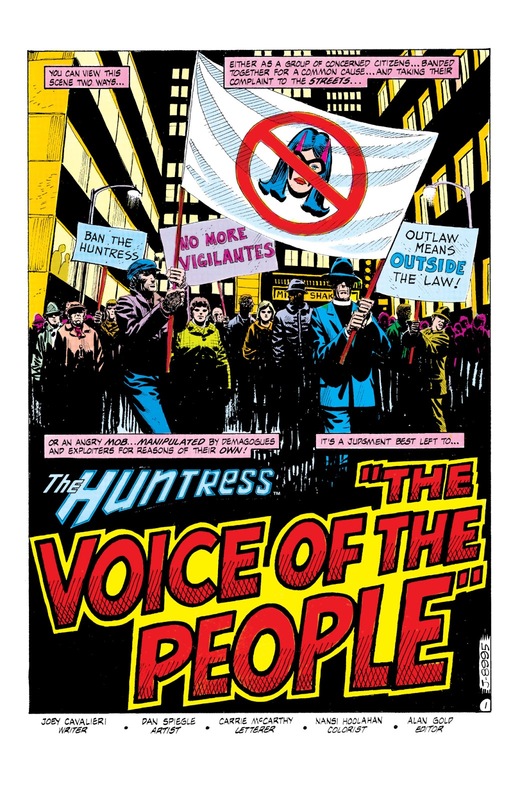 Ironically, the victim in all of this is the Huntress. 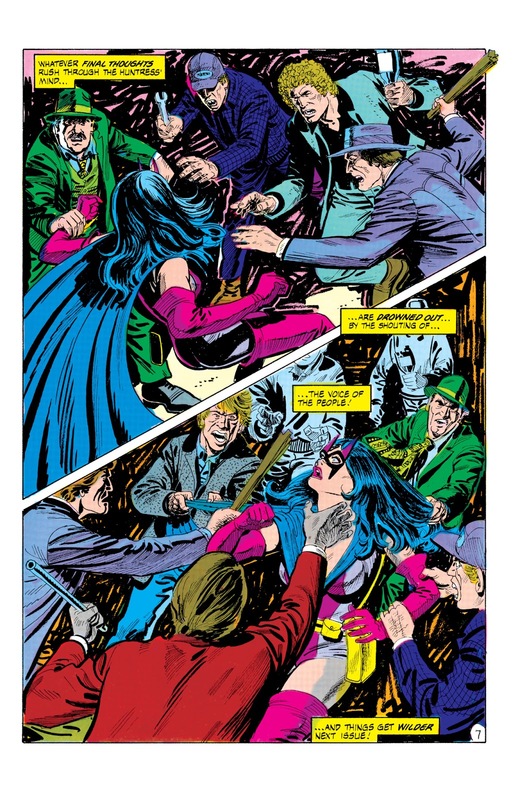 Apart from the fact she has become the centre of controversy in Gotham (which will surely create more problems for her already turbulent relationship with Harry), her vigilantism is being exploited by two people looking to advance their careers at her expense. Of the three antagonists, the party that has the most to gain from her removal is the Earthworm. Whereas both Terry and Nedra are staking their careers on a convenient lie, the Earthworm has absolutely nothing to lose. Even if Terry and Nedra fail in their tasks by being exposed, the Earthworm still walks away unscathed. As for the Huntress? She definitely has an unprecedented challenge before her. Unlike her previous cases where she had an actual bad guy to fight, she is up against Gotham's citizens who are questioning her character and motives. Any wrong move on her part could end up validating the accusations being made against her. 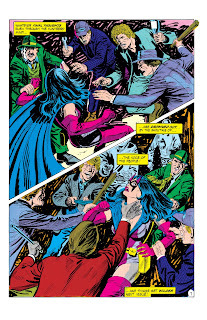 On the other hand, not defending herself against an angry, uninformed mob can risk exposing her real identity of Helena Wayne as well as having real violence committed against her.